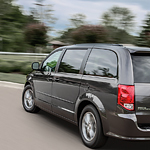 If you're searching for a family minivan that is filled with features designed to keep you safe, consider the 2019 Dodge Grand Caravan. It is built with a high-strength steel that will take care of any of your driving needs in Saluda. The design was made for maximum vehicle-impact protection. Both the front and the rear of the vehicle have crumple zones that will direct impact energy away from the cab where you and your passengers are sitting. Saluda Motor Sales can show you the Parkview rear backup camera that will let you get in and out of tight spaces with confidence. You'll get a wide-angle view of the area behind your car on the Uconnect Touchscreen. The screen is clear and easy to view in any lighting conditions. This view will let you avoid hitting anything, stationary or moving, as you reverse.